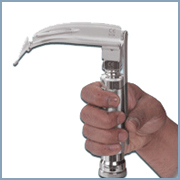 Manufacturers and exporters of fiberoptic laryngoscopes, fiberoptic laryngoscopes blades. 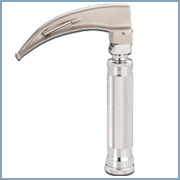 we are manufacturers & Exporters of Laryngoscopes Fibre-Optic , which are used for Laryngoscopy. The Features of Laryngoscopes Fibre-Optic are given below. Hook-on Handle used with Conventional Blades can be used with Fibrelite Blades also. Hence no need to purchase any extra or special Handle. The Handle shown in the picture is sold separately. There is no need to purchase any extra or special handle, as your existing hook-on handle can be used. We offer Macintosh Fibrelite Blades (English profile) in various sizes for infant, child, adult and old. All the blades are made from medical grade stainless steel. Macintosh Fibrelite Blades are available in Matt finish. Miller fibrelite blades are made of best quality stainless steel. Fibrelite Blades are available in Matt finish. 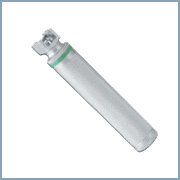 These Miller fibrelite blades are available in various sizes for neonatal and infants. 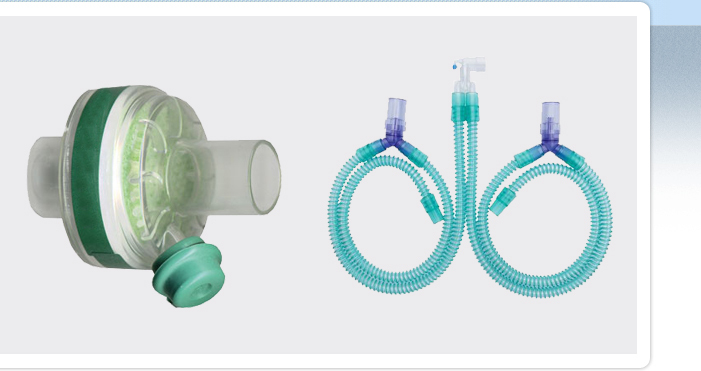 We Manufacture & Exports Fibrelite Lamp , which are used in Laryngoscopy world wide. Only Hook-on type Blades & Handles are marketed by us. Fibrelite Blades are only available in Matt finish. All Blades are made from Stainless Steel. All Handles are made from Chrome plated Brass & available in Shiny finish only. Fibrelite Blades with Flexible Articulating Tip Can be used on any standard hook on handle complying to ISO standards, hence no need to buy an additional handle separately. 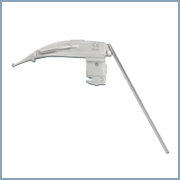 Its Articulating tip provides precise control to elevate epiglottis & Unique anti-seize spring action ensures long life & smooth operation . 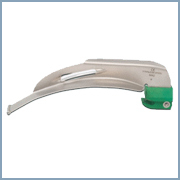 We provides Fibrelite Blades , which are used in Laryngoscopy & are available only in matt finish with three size. 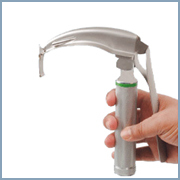 The Standard Handle of Laryngoscopes Fibre-Optic Green System is used in Laryngoscopy & Accepts two size C 1.5 V cells. Accepts two size C 1.5 V cells. 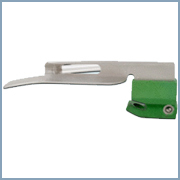 We are Manufacturers & Exporters of The Penlite Handle of Laryngoscopes Fibre-Optic Green System , Which is used in Laryngoscopy & Accepts two size AA 1.5 V cells. Accepts two size AA 1.5 V cells. We provide Howland locks for fiber optic blades in two choices i.e. chrome plated brass and stainless steel. 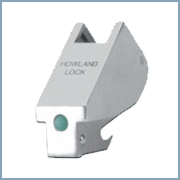 These Howland locks are compatible with all fiber optic blades. Our locks provide natural lifting to simplify laryngeal exposure, making intubation possible even in the most difficult cases. Use with Standard Blades & Handles. 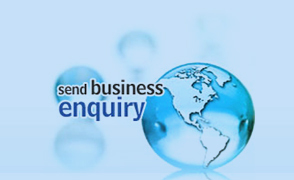 We offer macintosh blades American profile in super fine quality. 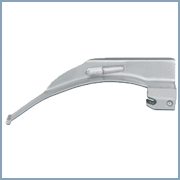 These interchangable blades are made of 303/304 surgical stainless steel for conventional laryngoscope. The American profile with a slightly more abrupt curvature and a flange starting at the lock of the blade and continuing to approximately where the curvature changes direction then disappearing. 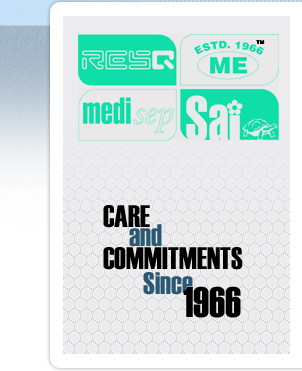 Our macintosh blades English profile are constructed with a single piece of 303/304 surgical stainless steel. This one-piece design is more robust and safer than the typical products. The Macintosh laryngoscope blade is one of the most popular blades in use today. The English profile has a smooth, gentle curve that extends from the base to the tip and a flange that starts at the lock and continues to the tip, narrowing gradually. Our miller blades are one of the most popular of the straight blades. These blades have tongue is straight with a slight upward curve near the tip. In cross section of the miller blades, the flange web and tongue form a C with the top flattened. One of the most popular of the straight blades. The tongue is straight with a slight upward curve near the tip. In cross section, the flange web and tongue form a C with the top flattened. 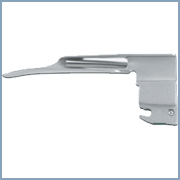 We Provide Green System Blades (Fibre-optic) with Flexible Articulating Tip , Which provides precise control to elevate epiglottis & Built in channel to help visualise and intubate with an unobstructed view . The Handle shown in the picture is sold separately. green system blades - macintosh in American profile are fully constructed out of medical grade stainless steel with Matt finish. These blades can be used on any standard hook on handle and therefore no need for additional handle separately. We offer green system blades - macintosh in English profile. 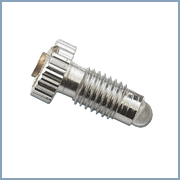 These macintosh are manufactured using best quality, medical grade stainless steel. Available in Matt finish, these blades can be used on any standard hook on handle and do not require additional handle separately. 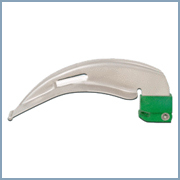 We offer Macintosh laryngoscope blades in American profile, which are disposable in nature. These American profile Macintosh blades have smooth and gentle curve. Our Macintosh blades are available in various sizes for newborn, infant, child and adult. 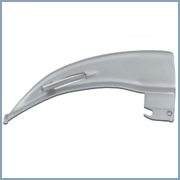 Our Macintosh laryngoscope blades in English profile have smooth, gentle curve that extends from the base of the tips. There is a flange at the left to push the Macintosh laryngoscope blades out of the way. We offer miller blades that have tongue is straight with a slight upward curve near the tip. These miller blades have the flange web and tongue form a C with the top flattened at the cross section.